How Much Protein Do You Really Have? Many researchers have used surface plasmon resonance (SPR) or have seen results from SPR in a presentation or journal article, but many of us still don’t know exactly how what we see on the screen is linked to what is happening on the surface. Many SPR instruments use a mysterious response unit called “RU”, which is an abstract unit that has no clear physical meaning. We know that more RU means more molecules are on the sensor surface, but many SPR users don’t know exactly how the two are related. Although it isn’t necessary to understand the meaning of “RU” in order to obtain kinetic constants or be successful with SPR, it can be useful when trying to understand what is really happening – or when you want to seem smarter in front of your colleagues. So, if you want to understand once and for all where your binding curves are coming from, and have something to talk about at your next awkward departmental social, read on. 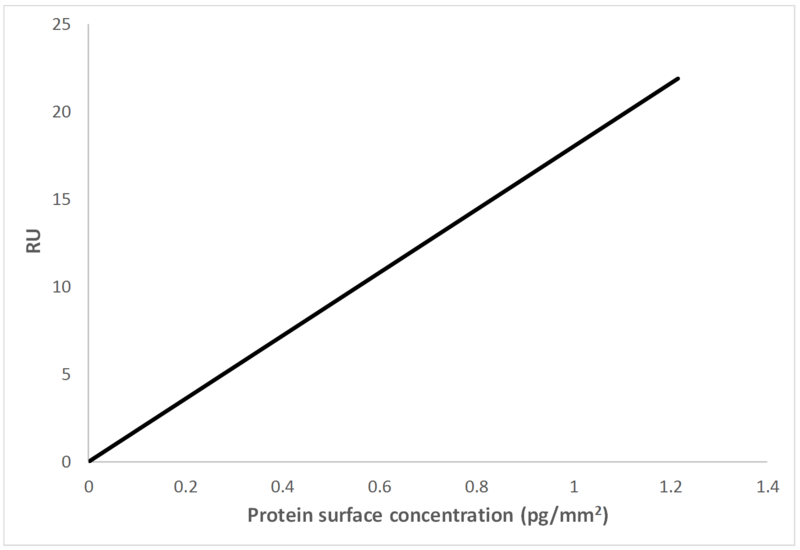 This formula can be used to calculate the refractive index of a layer of adsorbed protein (nprotein) on a surface over a range of surface concentrations of the protein on the surface (cs,a). In this formula, nbg is the refractive index of the background medium (the running buffer), Mprotein is the molecular weight of the protein, dprotein is the thickness of the adsorbed protein layer, and α is a constant called the refractive index increment of the molecule, also known as dn/dc. 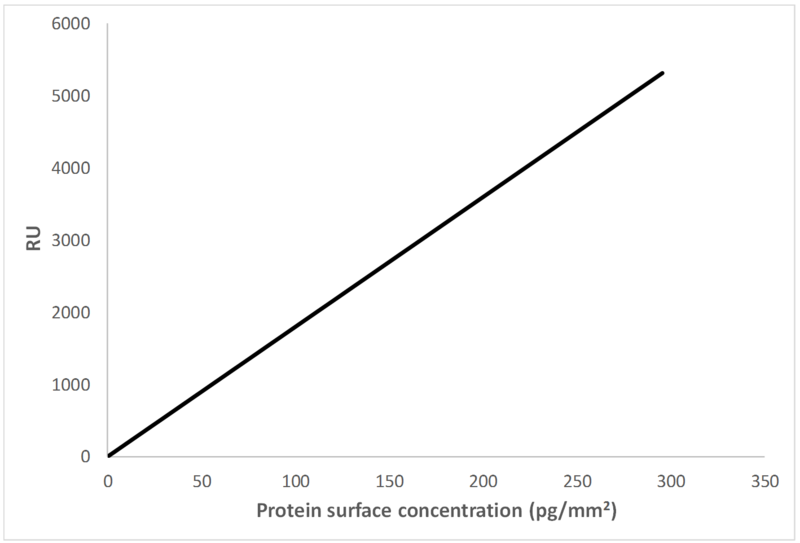 This value can be measured with a refractometer experimentally, but many people assume it is the same for most proteins at 0.182 g/cm3. Now comes the magic. If we move nbg to the left side, we will get an equation for the difference in refractive index between the background medium and the protein layer (Δn = RIU). It is this difference that causes the SPR signal to change. In other words, this equation tells us how much the refractive index is changing at the surface of the sensor for a given protein concentration. SPR specifications are often quoted in terms of refractive index resolution, and this is why. When a manufacturer says they can measure changes in RIU down to 10-6, they are saying that the right side of eq 2 must be larger than 10-6 for it to appear above the noise level in the instrument. As an important note, you can approximately convert from RIU to RU by multiplying by 106. Keep in mind that RU is proportional to the change in the reflected light angle caused by a change in the refractive index. So, using eq 2, you can relate this RIU limit directly to the protein concentration on the surface. Again, many manufacturers will give a specification in terms of pg/mm2 for the lowest concentration of molecule that can be measured. In fact, many companies will approximate that 1 RU = 10-6 RIU = 1 pg/mm2. Although this may be experimentally determined, it can also be estimated from eq 2 based on the smallest RIU that the instrument can measure and making some assumptions about the molecules being measured. As an example, we’ve calculated and plotted the change in RI for a typical IgG with a molecular weight of 150,000 Da and a thickness of 10 nm (end on orientation) . We’ve plotted the surface concentration of the IgG versus the change in refractive index that is produced. Note, we have used units of RU for the y-axis and units of pg/mm2 on the x-axis. If we zoom in on the above graph (below), we can see that at a concentration of 1 pg/mm2, we have an RU of about 18, which is not too far off from the simplified relationship of 1 RU = 1 pg/mm2 that is often cited by manufacturers. One reason for this discrepancy is that most SPR sensors are not a simple, flat surface as assumed in this analysis, but a 3D matrix of dextran. We’ve also made assumptions about the thickness and molecular weight of the protein, as well as the conversion of RU to RIU, which all impact the exact limit. Now, don’t panic if this doesn’t look like anything you have ever seen in your SPR experiments. It isn’t because you are doing it wrong, it is because we have neglected the time component of SPR experiments in this discussion. Stay tuned for another blog post which will dive even deeper into this topic! You may have initially thought that surface plasmon resonance was complicated, but with the help of a little math, you can now confidently say you understand how the response signal on the software screen is related to your protein density (thanks to the wonderful de Feijter’s formula). J.A. de Feijter, et al., “Ellipsometry as a tool to study the ad-sorption of synthetic and biopolymers at the air-water interface.” Biopolymers, Vol. 17, pp. 1759-1772, 1978. Z. Cheng, et al., “Human Immunoglobulin Adsorption Investigated by Means of Quartz Crystal Microbalance Dissipation, Atomic Force Microscopy, Surface Acoustic Wave, and Surface Plasmon Resonance Techniques.” Langmuir, Vol. 20, pp. 5870-5878, 2004.